Phil Chadwick's Art: #0089 "Off-Season"
From the winter of 1979-1980. This would have been painted in Edmonton after we moved. An abandoned lobster pot at Eastern Passage, Nova Scotia in the winter of 1979. A fisherman was afraid that I intended to rip it off...but I only wanted to look at it! 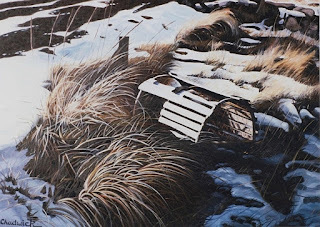 This is another look at the same lobster pot that I painted in #0065 "Abandoned in the Snow". The lighting and orientation are very different. I rarely paint the same thing twice.